Awaiting her name to be called to receive her diploma! I loathe fear and I’ll tell you why. Number 1 it is from the very pit of hell. Number 2 I’ve been struck hard with it and paralyzed by it. I despise fear. See that girl in the photo? She’s our Hannah girl, she (and her cousin, Simon) have my very heart – I love them both to the moon, infinity and beyond! 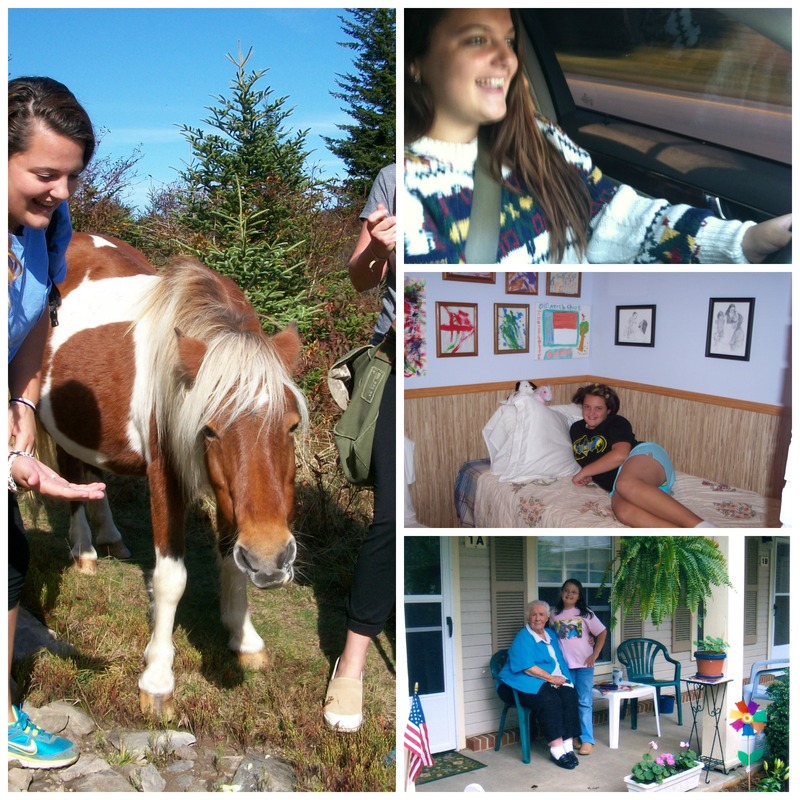 Hannah’s mom lives in fear – it dictates every step she takes, I hate it for her and I have tried over and over, sometimes successfully, to push her to step out of fear and do something brave. drove Grandpa’s old Chevy pickup truck up and down our dirt road, avoiding the creek when doing the hard turn at the end of the holler! Every time the fear bug began to invade, we would sing – to this day it is our mantra. 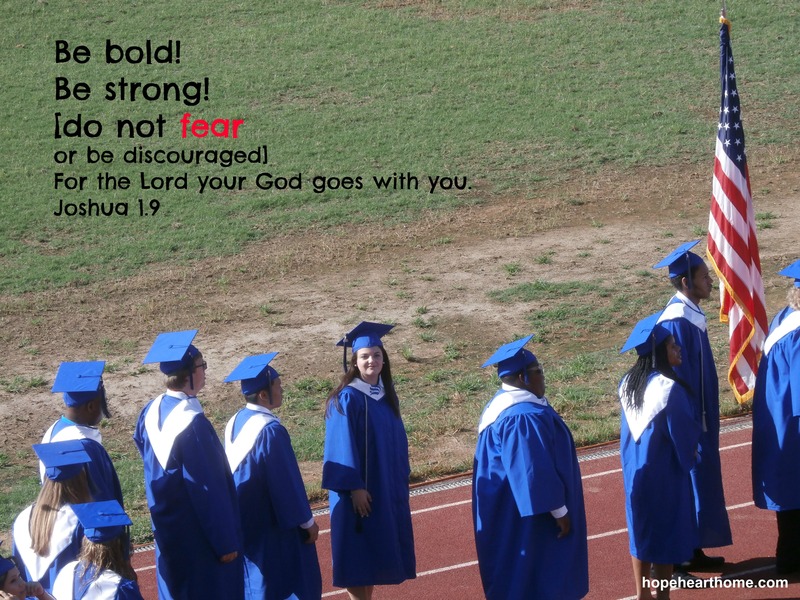 Be bold – be strong…FOR THE LORD YOUR GOD GOES WITH YOU! Today, at 18-1/2, a high school graduate, headed to college, our girl is BRAVE. She is my BRAVEHEART – she walks with #NOFEAR. Love this! And I appreciate the steps you took to help Hannah come against fear. What a beautiful, brave girl! My son graduated from high school this year too. What an exciting time it is for them. Praying for each one to go boldly forward with #nofear. Many blessings to you! Following you at FMF. Julie, congrats to your son! Rah Rah the class of 2015. Thanks so much for swinging by! 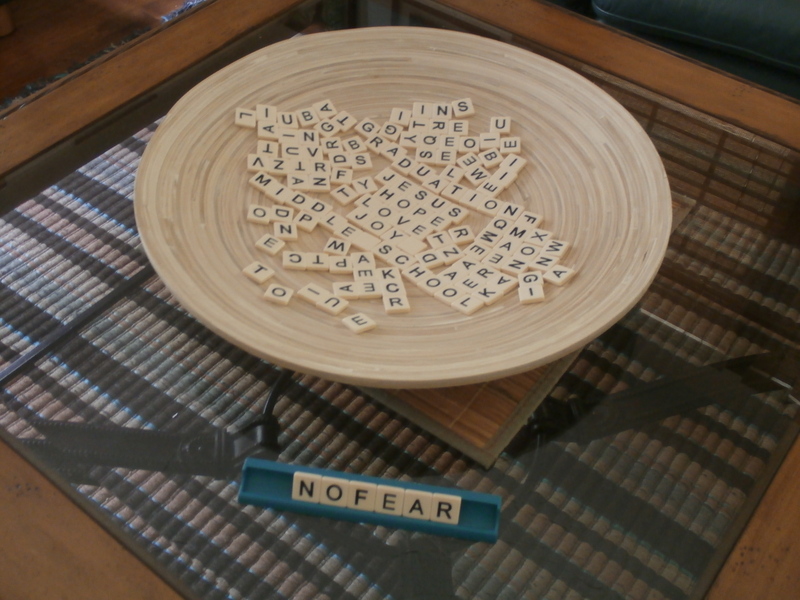 Sus….fear is a special tool of Satan. He knows ????? better than us just how great GOD has equipped us but if he can stop us with fear………….. You know the rest. Just this week I heard Joyce Meyer say as only she can, “Stop being overwhelemed”! Fear attempts to overwhelm. It’s hateful, it’s of satan and his buddies and as you said from the pit of hell. I remember that little girl who was afraid to ride a bike……. FAITH always overcomes fear and with the aid of her NC family and much prayer, God has instilled in her FAITH. Good work Mimi. K…Your last three words…quickened my heart and brought tears. Oh my, how emotional I am!!! IF I had just a wee part of this child’s faith development, I am beyond words of gratitude. What a holy and high privilege. Oh Lord let it be so. What a sweet tribute. I just love reading about your heart for your family. That mantra is so great too. Go Hannah! Natalie, there is a song with the words but I cannot remember who sang it – but it’s a good one. Thanks, always, for stopping by my young friend! Good for you – teaching her to face her fears head on! I love the picture with the letter tiles. 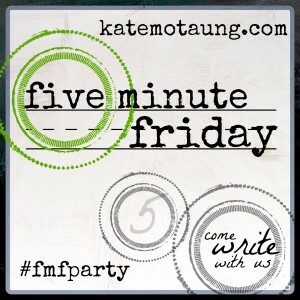 You and I are alike with this FMF thing – I can’t wait to see the word prompt, but then I let it ruminate. Is that cheating? I hope not! Because I had a direction I wanted to go t00 and that was Father’s Day and my dad. Heaven knows I’ve had fears concerning him and it worked out perfectly. Thanks for sharing again today, I love reading about your life and connecting each week! Ruth, ME TOO! And, no, it is not cheating. It is being thoughtful. LOL! Thank you for your extreme kind words. THANK YOU for reading and taking the time to visit Hope Heart Home today, Sarah! GOD gave children grandparents for a reason. He knew how they would be needed. He’s so smart. Your love for Hannah (and Simon) beams through this post. You taught her to be brave, trust in God and not fear. Loved this post!! 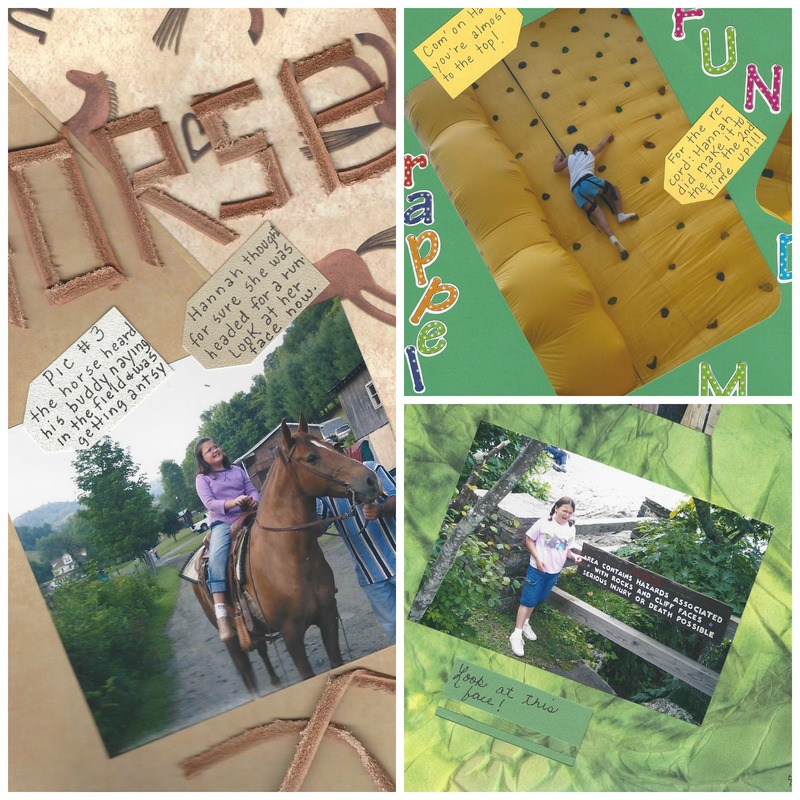 Thank you, Tara – they are awesome kids! Doing it afraid! I love that! Fear has kept me from a lot of things. Experiences, opportunities, relationships. Now, at almost 31, I’m just disgusted with it. I see older women who are still ruled by their fear and I just don’t want that to be me. So, doing it afraid. I’ll be giving that a try! It’s never too late to do it afraid! Blessings, Marie! Congratulations to your Hannah! I know with brave examples in her life, she’ll learn to live in the Father’s love (and outside the bonds of fear). I love this, and the courage that’s evident in her as she looks into the camera. You’ve done well by her; be proud! I am, Andrew, I am. I’m SO proud of our Han too!!! What an honor its been to help train up this young daughter! And, you have done an awesome job. Mom. Loved reading this… I’ve struggled from fear in many ways during a large part of my life. I’ll never forget the Pastor at the Morrin’s church preaching about worrying and fear–it has stuck with me for so Many years. Although, it will occasionally enter my mind (especially with a teenager), in which I dismiss, his words healed me from my fears and worries. My biggest fear after going through a depression many years ago was death. Today, I never fear death, the Lord took my depression away as well as my fear of death, for I know where I, as well as my daughter, will be when it is our time leave this earth. It’s such a blessing to have something to look forward to after this worldly world. Thank you for sharing! Well Sonya, this fills my heart with such joy and peace! Three things: so glad we re-connected; glad you visited my blog; AND BEST OF ALL – YOU HAVE JOY & PEACE IN CHRIST! And, Hannah is a beautiful and lucky girl to have as a role model in her life. What a blessing you both must be to one another. Congrats to her! 🙂 I’m blessed to have her!